Todays vet visit was a great one! Vet declared him HEALTHY. This little boy was worth the $8,000.00 we spent on him. We are broke now but he is alive and is ready for adoption! Well first of all, let's state the obvious. Without SACHI ANIMAL RESCUE, this little bundle of love we named JETHRO would not be alive today. 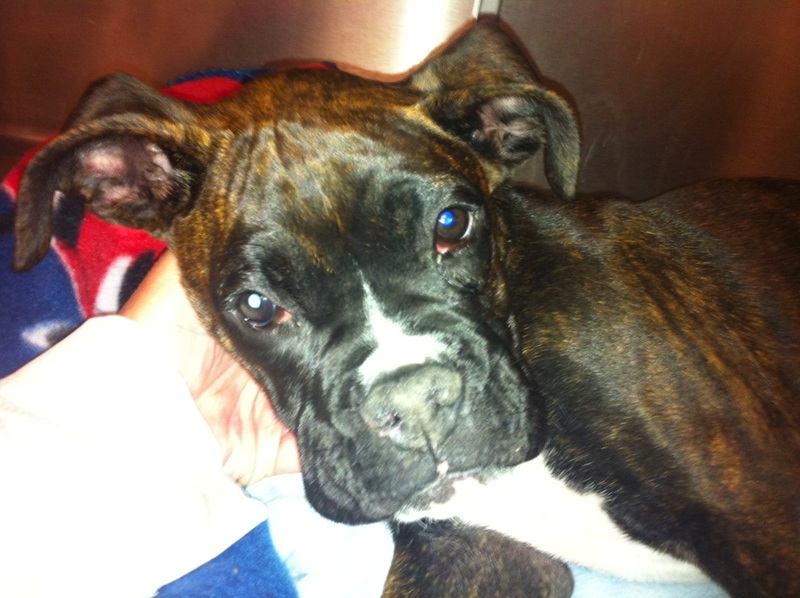 March 1st, 2012, began with a trip to the Castaic shelter to bail out a 9 month old boxer named Root Beer who had been turned in by his owner for being aggressive to other dogs... and apparently wasn't too keen on people either. 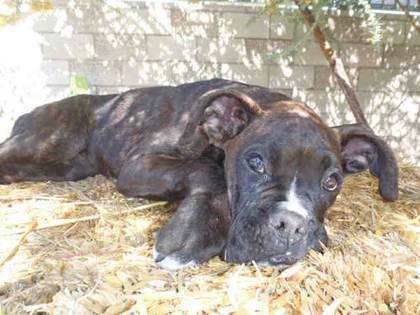 After loading up Root Beer in my car, who turned out to be a loving little guy with some insecurities...(big big surprise with a boxer!) and who was eventually adopted into a fabulous family up north, I made my way to the East Valley shelter in Van Nuys to go evaluate a senior pair of boxers who were also on their last legs there. Sasha and Max IV as they've become known to the SAR family turned out to be beyond wonderful and ended up the next day in the loving arms of Veronica and her family where they are currently being fostered while awaiting adoption. While I was doing their paperwork, I ran into an old rescue friend Leegie who was clearly disturbed after visiting with a 3 1/2 month old boxer puppy turned in that day by his careless, neglectful owner. As Leegie and I entered the ISO room where the little guy named Tigger lay in a cage immobile and in pain, barely breathing, we both started crying. The odds of him making it through another day were poor at best. The slightest touch would provoke gut-wrenching screams, he would not take any food or water and his gums were extremely pale. His "caring" owner had apparently waited 2 weeks watching him become weaker and more lethargic until he stopped eating, drinking and walking all together. After two more days of agony he decided to dump him in the shelter where of course he would be so well taken care of! Our choice was simple, either end his agony right there and then or commit to him fully and try to save this little guy's life. I knew from past experiences that it would be a long arduous road and always important to rescues, a very expensive one, without guarantee of any positive outcome. I estimated quickly in my head that SAR would probably be spending around $5000.00 on Tigger. Little did I know I was grossly underestimating the final tally. Anyway when I am faced with these types of instantaneous decisions, and time was definitely of the essence there, and looking straight into the eyes of an innocent, defenseless, lonely little creature, my heart made the decision against all logic. "We're taking him," I told Leegie. We sprung into action; while I was trying to accelerate the paperwork process, Leegie started making calls to the closest reputable emergency 24-hour hospital. Being LA mid afternoon, there was no time with traffic to take him to my first two places of choice, ASEC or Dr. Feldman in West Hollywood. We renamed him Jethro as we were hoping a new name would be a sign, a good omen for the future. Plus let's face it, Tigger....! With the help of some dedicated shelter personnel, we rolled him gently onto a blanket and carried him to Leegie's car. Jethro ended up at Veterinary Specialists of the Valley in Woodland Hills where he would remain for the next 10 days, the first 4 of them in intensive care. He barely improved from Thursday to Saturday. Batteries of tests were ordered, always with no definite results or estimates of his condition. 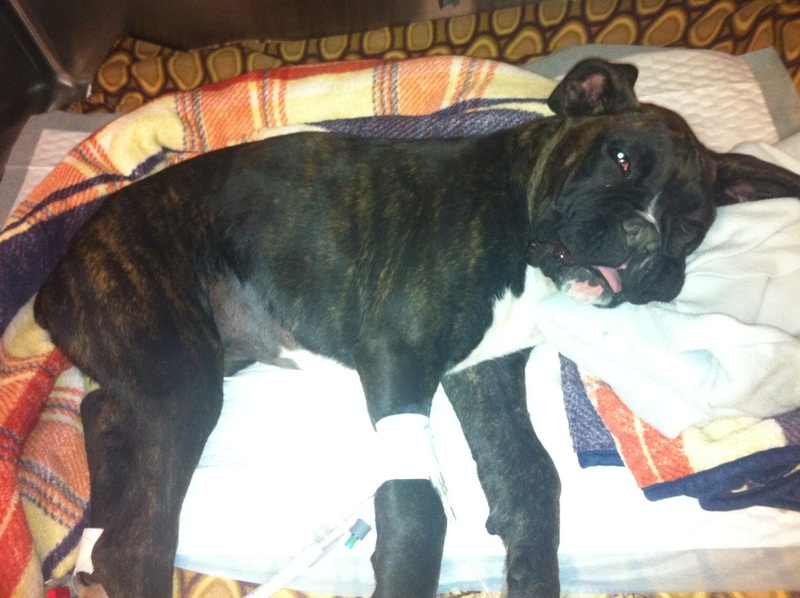 On Saturday night, March 3rd, Jethro took a turn for the worse and had to be moved into an oxygen tank to help his breathing. On Sunday morning March 4, as I was making the drive to visit him I felt I had to make a decision, by then $6206.10 had been spent and Jethro was definitely not getting better. I entered the hospital dreading the worst and expecting to have to make an awful yet necessary decision for the well-being and, simply put, survival of SAR. As I entered the back area, I was greeted by a beaming Leegie (who stayed at Jethro's side for the main part of those past 4 days) holding a brindle bundle of love who was actually reacting and licking her face. He could not walk or stand on his own but had definitely turned a corner. He was not wincing and crying in pain at the slightest touch and seemed to actually have a pulse and a definite will to live. He was now eating and drinking on his own. He was finally becoming the puppy he should have been all along. There was then no other choice but to keep going. 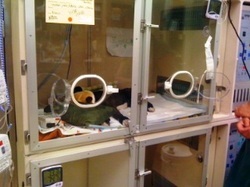 Jethro remained in the hospital until March 10, when he was finally released into the loving arms and home of Leegie who has fostered him ever since. So what was his condition, you may ask? All along meningitis was suspected coupled with polyarthritis or steroid-responsive meningitis-arteritis in juvenile boxer. Why did it take so long to get a true diagnosis? Based on my conversations with the different vets on his case, the fact that he was so far gone and weak when he first arrived, literally his little body was shutting down, the required treatment for this type of condition could not work efficiently without affecting other organs in his body, therefore constantly showing signs of different potential problems. Steroids affected his kidneys already enlarged and so on. In layman terms, the medications treating his disease were also causing damage in other areas. Careful monitoring and dosing was therefore essential and of course, time, time and more time. Giving Jethro the time to recover was key and in that case the old adage proved true, time is indeed money! Yesterday, May 7, 2012, Dr. Feldman pronounced our little stinker a HEALTHY BOY. Now the race is on as to who will be the lucky parent of our Jethro. We are taking applications NOW! Today was a big day for JETHRO. He was finally released from the hospital. Still a little weak but walking on his own! The little man went straight into a foster home. More to come once he settles in. (by Leegie): Here are some pics of him today, he can stand, with support, if you have any of those bands they use to support dogs while walking, that is what he uses when he walks – he uses two of them, I don’t have any. His muscles are so atrophied, poor boy, but he is getting stronger every day, he went from a laying position to a sitting position by himself today, first time ever. Doing a little better while in the oxygen tank. Keep fighting little man! (by Leegie): Don't have valley fever results yet but all other fungal tests are neg- doc does not think VF, as he would have declined on steroids. Switching some of his antibiotics, he is on 4 different ones now, they wanted to put him on some medicine for auto immune disease but no one has it, they have called everyone to try and get some, it is on manufactor back order. They promise me the drugs are keeping him out of pain. Which is the most important thing. He is so sweet, resting, Wyatt brought him a toy, thought it would make him feel better and want to get up and play... They want to run a few more cultures of the fluid in his joints, but it will take 2-3 days to get results, and I don't know that it is financially doable to keep going while we wait for more test results- but for now, they just do not know what we are treating. Jethro seems more alert and responsive this evening, moving his head around more and more wide eyed and trying to interact more. He did a poo (normal looking) and even tried to "crawl away" from it. He is resting comfortably and I will call first thing in the am and get an update go and then go and see him in the morning after Wyatt's baseball game." Test for Liver shunt came back negative. Valley Fever test is still pending. (by Raphaele Brilliant): This is Jethro, his original name was Tigger, so of course we had to change that immediately. there he was. Wonderful Veronica who runs New Hope Program at East Valley immediately put out the pleas to all rescues. He needed immediate veterinary attention or didn't stand a chance, and he is far from out of the woods. 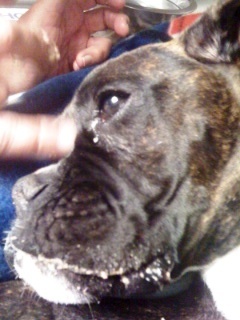 While there he crashed at least once, gums very pale. Every inch of his little body was in agony, he would cry in pain at the slightest touch. We had to make a decision fast or he wouldn't have made it through the evening. We knew it would be costly but watching that delicious little guy suffer in vain was no longer an option. These are the cases that break not just your heart but your bank account. We knew it would be expensive, so far $2000 and counting but this was the right choice to make. While I pulled him for Sachi Animal Rescue, wonderful Leegie rushed him to the closest reputable emergency place where he is under 24 hours care, with his own private nurse. Tests have come back negative for parvo, ultrasound shows enlarged kidneys and a small liver, possibly born with a liver shunt. Blood panel is normal. We will have more results tomorrow, regarding his liver, and also running tests for valley fever and meningitis. He is heavily medicated for pain so he is at least no longer suffering. 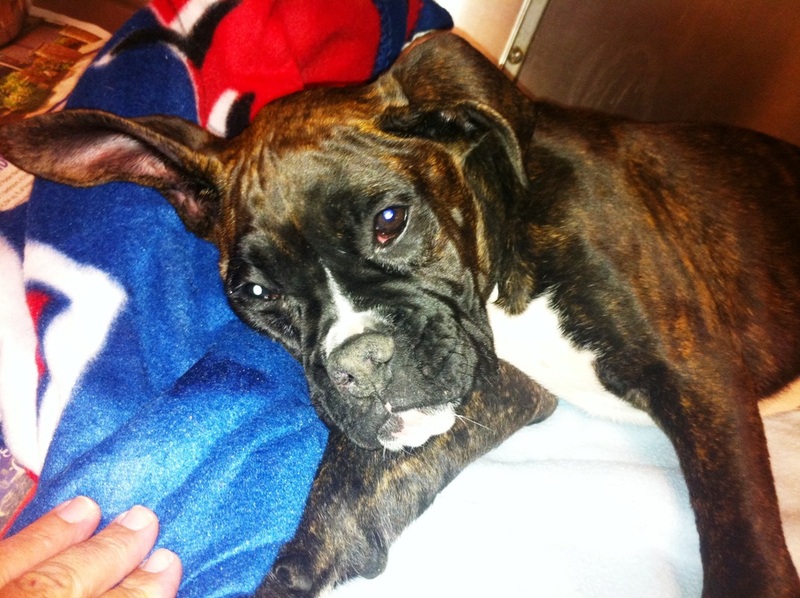 Please keep this gorgeous 4 months old boxer puppy in your thoughts and help SAR with the medical bills. He is absolutely worth fighting for, as they all are.